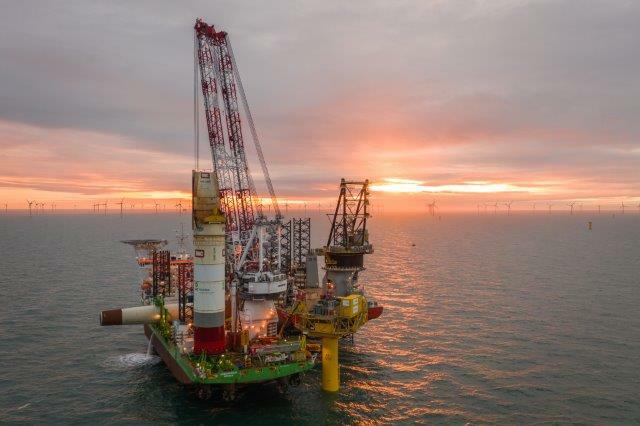 The Topside of the Offshore substation of the wind farm EnBW Albatros was installed the night from March 26 to 27, 2019. The Heavy Lift Jack-Up Vessel (HLJV) Pacific Ospray had loaded the Topside in Rotterdam. In the construction area, the HLJV Innovation lifted the Topside on the foundation (monopile and transition piece) that had already been installed. The Pacific Ospray will be jacked up and remain next to substation because of still outstanding coating and welding work. Afterwards the jack up vessel Seafox2 will come to commission the Offshore substation. The transformer platform for the neighbouring EnBW Hohe See wind farm was already installed in the summer of 2018. Damen Shipyards has awarded SMST a contract for the delivery of an Access & Cargo Tower and 3D Motion Compensated Crane for the new build Service Operation Vessel (SOV) of Bibby Marine Services. The SMST equipment helps Bibby to safely transfer their maintenance personnel and cargo from their Damen-built SOV to the offshore wind turbines. The vessel, sister ship to the Bibby WaveMaster1, will operate for EnBW and Siemens Gamesa Renewable Energy in the offshore wind farms Hohe See and Albatros. ZF Friedrichshafen and Schaeffler are collaborating to develop new solutions for predicting the operating life of wind turbine gearbox components based on the actual loads that occur during operation. Since September, the first wind turbine gearboxes equipped with sensors and condition monitoring systems have been supplying operating data to a cloud-to-cloud solution to enable this to happen.